The apostle Paul. The converted terrorist, inspired author, amazing teacher, and patient mentor.This colossal figure strode boldly onto the stage of the first-century world and left an indelible signature of greatness never to be forgotten. His life? Magnificent! And his ministry? Impressive. While assigned sainthood by some today, by his own description he was "the chief of all sinners." No other person in the Bible, aside from Christ Himself, had a more profound influence on his world and ours than Paul. He was a man of real grit, with a firmness of mind and spirit and unyielding courage in the face of personal hardship and danger. Tough, tenacious, and fiercely relentless, Paul pursued his divine mission with unflinching resolve. And God used him mightily to turn the world upside down for Christ in his generation. 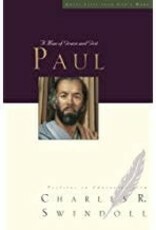 But Paul's message and his style were also marked by gentle grace. This man, who tormented and killed the saints of God, understood and explained grace better than any of his contemporaries. Why? Because he never got over his own gratitude as a recipient of it. God's super-abounding grace transformed this once-violent aggressor into a humble-but-powerful spokesman for Christ. A man with that much grit desperately needed that much grace. Perhaps that's why Paul's life is such a source of hope for us. If the chief of sinners can be forgiven and become God's chosen vessel, can He not forgive and use us as well? He can, if we too become people of both grace and grit. Paul is the sixth of a multi-volume series exploring Great Lives from God's Word and searching them to find the qualities that made them great. 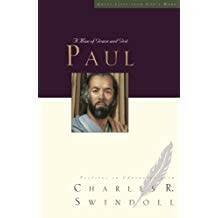 Join us for an exciting, in-depth look at this amazing life, as only Chuck Swindoll can describe it: Paul: A Man of Grace and Grit.